Hyperion’s Romantic Piano Concertos series has reached volume 68, and if the previous ones in the series failed to impress this reviewer, this latest volume presents a major discovery. 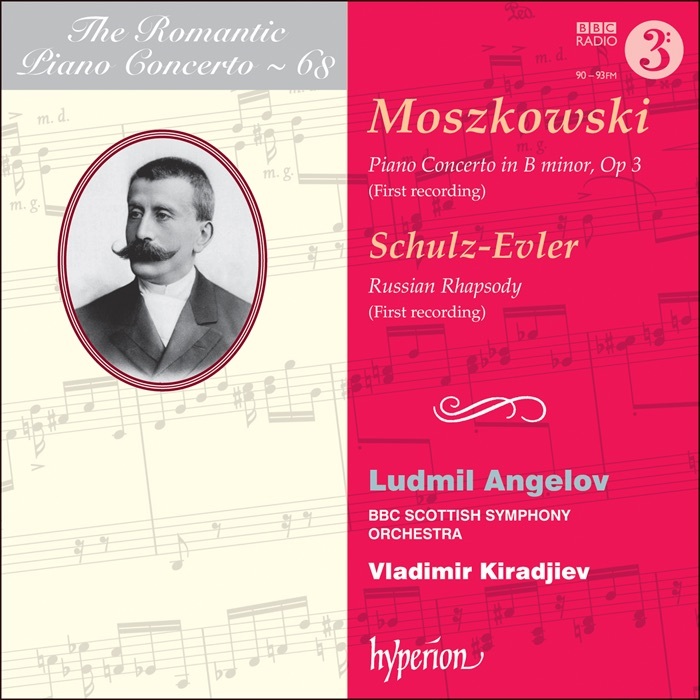 Lovers of Romantic piano concertos will know Moszkowski’s Piano Concerto in E opus 59 or Enticelles (a favourite Horowitz encore), while some might have heard a few of his etudes. The E major concerto featured in volume 1 of the Hyperion series and has received many other excellent recordings, not least the recent one from Joseph Moog. It had long been believed that there was only one Moszkowski concerto, however the indefatigable super-pianist Ludmil Angelov unearthed an earlier concerto and gave the first performance – now he’s made the first recording of it as well. In short, this a masterpiece and one of the most important additions to the Romantic piano concerto repertoire. The technical demands will likely keep the concerto away from a majority of pianists, however the musical quality and brilliant orchestration are rewarding for soloist, conductor and not least the audience. The four-movement work is over 50 minutes long and in the same heavyweight class as Brahms’s Second Concerto, which also has four movements. The longest is the 20-minute last movement Allegro, where the demands on the soloist even surpass what Brahms could think of. The rest of the disc is taken up by 11-minute Russian Rhapsody by Adolf Schulz-Evler, the composer known for his wizardly ‘Blue Danube’ transcription. Here is sheer frivolity and fun – a joyous ride over the black-and-white keys – but something that doesn’t carry the weight or leave a huge impression that the magnificent Moszkowski opus 3 Concerto does.